A steal at just $99? We've heard rumours of an even cheaper version of the Nexus 7 before, and now another member of the supply chain has said it exists. Asia-based display component maker O-Film Tech has said it started shipping parts for the cheaper Nexus 7 this month. The company's touchscreen technology, known as glass-glass film, will mean lower production costs and help make the device thinner, according to Digitimes. 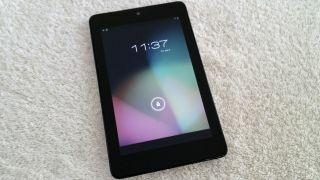 The cheaper Nexus 7 could cost as little as $99 - as we previously heard - though maybe not at first. It could initially be priced around $129 to $149, according to the report. Which isn't that much cheaper than the current Nexus 7. The usual caveats apply, this being Digitimes. It's not renowned for its accuracy, let's put it that way. Between 500,000 to 600,000 cheaper Nexus 7 tablets are expected to ship in the first three months. We first heard about the super cheap Nexus 7 back in September. It was originally thought to be out in time for Christmas, but that doesn't look too likely now. Last month an analyst thought the device could well be made real. Asus - which makes the Nexus 7 for Google - is also rumoured to be working on an affordable tablet, possibly to be unveiled at CES in January.